Glory Fast Boat is premium boat from Bali to Nusa Lembongan and return. Glory fast boat departed from Sanur Beach (Bali), easiest harbor to find direct to Nusa Lembongan, transfer duration only 24-30 minutes. Glory Fast Boat is premium boat from Bali to Nusa Lembongan and return. Glory fast boat departed from Sanur Beach (Bali), easiest harbor to find direct to Nusa Lembongan, transfer duration only 24-30 minutes. Glory Fast Boat launched the boat, with big capacity, named Glory Express II. 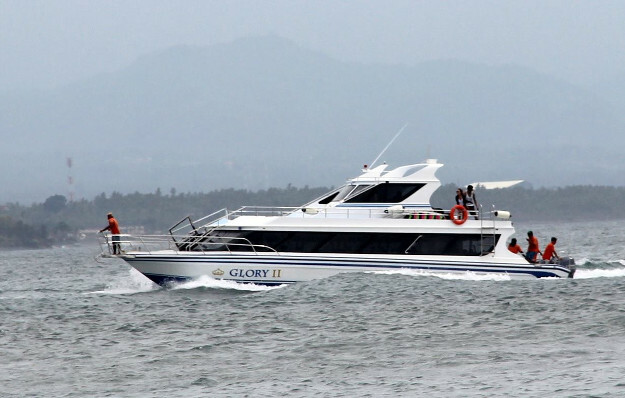 The boat offers enjoy plush seating and panoramic views aboard the brand new Glory Express with top speed 30 knots. Glory Fast Boat is owned by local people, supported with licensed captain boat, crews and professional staff. Glory Fast Boat guarantee your transfer from Bali to Nusa Lembongan will fast, safe and also cheap with 3 times daily schedule (Sanur – Lembongan and return). There are many option to reach Nusa Lembongam from Bali. Many boat operators offer fast and cheap transfer to Nusa Lembongan. We recommend to use some operator which have good reputable and many times work with our company like Glory Fast Boat. You will get not only fast boat ticket but also free pick up service/ drop off in Bali and Nusa Lembongan. It is very simple arrange the transfer with us, just follow the step of our online booking, choose Glory Fast Boat, input detail your name and your hotel address to pick up, do the payment and get e-Ticket. Sanur to Nusa Lembongan boat transfer also covered with insurance and free pick up/drop off service in Bali and also Nusa Lembongan base on sharing transfer. Free pick up/drop off in Bali cover Nusa Dua, Jimbaran, Kuta, Legian, Seminyak, Ubud center and Sanur.